Domesticated poultry stay healthiest and happiest when they have some kind of protective shelter available for their use. Chicken coops or houses vary greatly in design, from very simple shelters to elaborate, climate-controlled buildings that have been optimized for maximum production. Choosing the right chicken coop for your birds can help improve your chickens' quality of life. Chicken coops, which can also be called hen houses or chicken houses, are designed with safety, shelter and convenience in mind. Chicken coops provide a place where chickens can get away from cold weather, storms, rain and wind. Coops can also be closed to keep predators from harming chickens or their eggs. Chicken coops also offer humans convenient access to the eggs, allowing for easy daily egg collection. Chicken coops vary greatly in size; some are so small that only one or two chickens fit inside them comfortably, while commercial chicken houses can fit thousands of birds inside. Your chicken coop needs to be large enough to comfortably fit all of your birds; make sure each bird has her own space within your nesting box and do not put more chickens in the coop than you can install nesting boxes for. Nesting boxes should measure 12 x 12 x 12 inches or larger. 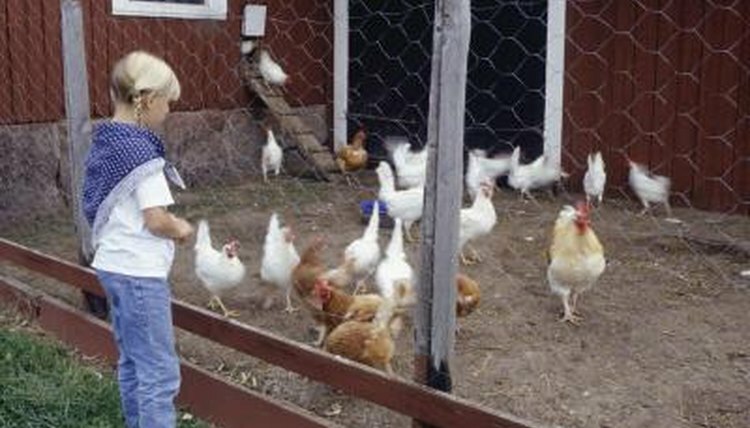 For chicken or eggs to be considered a free-range product in the U.S., the chicken has to have some type of access to the outdoors. A wide variety of chicken coop designs allow you to decide how much outdoor access, if any, you want your birds to have. Many chicken coops feature a door that allows chickens to go outside into a fenced-in enclosure or yard. Other coops may simply open into the actual outdoors without the safety of a fence. Chicken coops can range from being very simple, three-sided wooden structures to barn-style buildings with plenty of creature comforts. Climate-control systems are common in chicken houses where hens are encouraged to incubate their own eggs and where young chicks are allowed to live. Electricity can make caring for your chickens after dark a much easier process. Artificial light can also be used to take the place of daylight and encourage more productive laying habits from hens. Some coops are even built on trailers so that they can be moved from location to location. Chicken coops come in a wide variety of design. Small, easily moved chicken coops that allow for some daylight access while still keeping the hens in the coop are called chicken arks. Arks are often triangular in shape. Another common coop design is the chicken shed, which is essentially a small shed that has been modified to contain everything your chickens need in their daily lives. The shed often features a slanted roof and removable windows for ventilation. The chicken house, commonly used by backyard chicken owners, is a larger-style coop that resembles a small house in design. Most feature an enclosed run so that chickens can have outside time when they choose to. As far as the outside appearance of the coop goes, many chicken owners enjoy getting creative with their coop design. As long as the coop is functional, providing protection and shelter for your chickens, then you can be as artistic as you like when it comes to outward appearance and design.